Cholecystoduodenal fistula secondary to gallbladder carcinoma (GBC) is extremely rare and develops when the tumor penetrates into the adjacent duodenum. A porcelain gallbladder is also a very rare entity that involves the calcification of the gallbladder wall and can be associated with the development of GBC. Herein, we report an unusual case of a patient with cholecystoduodenal fistula, which has been caused by aggressive mucinous gallbladder carcinoma with a porcelain gallbladder. A 68-year-old man was referred to our department due to significant accumulation near the neck of the gallbladder detected by FDG positron emission tomography/computed tomography (PET/CT), which was performed as a check-up of postpneumonectomy for lung cancer. 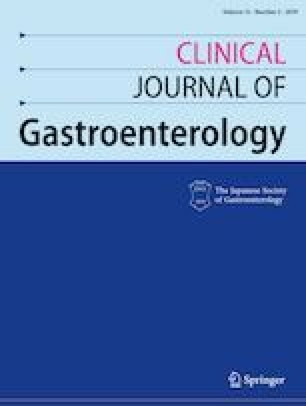 Abdominal contrast CT and magnetic resonance imaging revealed porcelain-like circumferential calcification of the gallbladder wall and a mass in the region detected by FDG PET/CT. Furthermore, upper endoscopy revealed a submucosal tumor with apical ulceration in the posterior wall of the duodenal bulb. Histopathological examination of its biopsy specimen rendered a diagnosis of adenocarcinoma. The patient was preoperatively diagnosed with either gallbladder cancer or duodenal cancer, and subtotal stomach-preserving pancreatoduodenectomy and radical cholecystectomy with gallbladder bed resection were performed. The resected gallbladder revealed a porcelain gallbladder, which formed the cholecystoduodenal fistula. These specimens were histopathologically diagnosed as mucinous adenocarcinoma of the gallbladder with an abundant mucin production. The authors state that they have no conflict of interest (COI). YM diagnosed and drafted this article. KF treated and supervised the process of drafting this article. EM treated this case. ES, SS, and KI diagnosed this case. HY supervised the process of drafting this article. All authors disclosed no financial relationships relevant to this publication. We state that there is none to declare. All procedures followed have been performed in accordance with the ethical standards laid down in the 1964 Declaration of Helsinki and its later amendments.